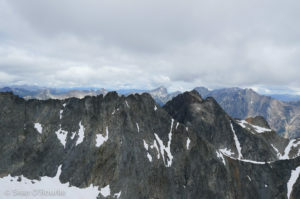 Robinson Mountain is the second-highest peak in the Pasayten Wilderness (after Mount Lago) and, according to Beckey, its southeast ridge is a “classic scramble” taking 1-1/2 days. I’m not sure I would call it a “classic scramble,” but it has both a short approach and little choss by Pasayten standards. Having spent the night up near Hart Pass again, I drove down to the Robinson Creek trailhead and got a late start around 7:00. This trailhead is actually the southern end of the Middle Fork Pasayten trail I had used for Osceola, and the trail is similarly well-maintained for stock travel. Unfortunately, this only means that logs are chopped, not that brush is cleared, so I got a good leg-washing between the bridges over Robinson and Beauty Creeks. 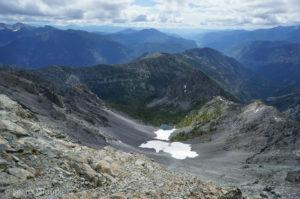 Unlike most Cascades valleys, Robinson Creek appears to be a steep, v-shaped river valley rather than a flat, u-shaped glacial one, so the trail climbs consistently from the trailhead. Expecting a minor climbers’ trail past the Beauty Creek bridge, I was surprised to find it nearly as well-defined as the main trail, and a bit less brushy. 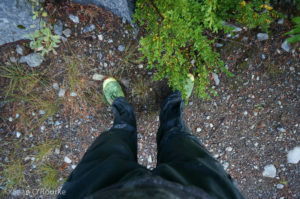 I stopped a few hundred yards up to wring out my socks, then continued climbing steeply along the left side of the creek. The trail is clearly mostly used by climbers: it rapidly fades as it crosses a meadow, with a cairn pointing out where to leave it for Robinson Mountain. I followed a bit of a tread up the meadow, then continued through open woods toward the little tarn at 6800′. 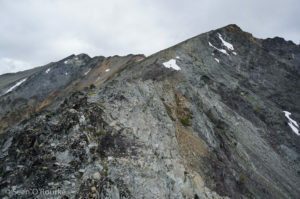 There seem to be several places to access the southeast ridge, and I chose one in the middle, with minimal scree travel and a short 4th class chimney. I found a faint climbers’ trail on the ridge, which is mostly a hike until the final few hundred feet. The talus is predictably wretched on either slope, but the crest would be pleasant even without the bit of trail. The summit comes into view shortly after gaining the ridge, still most of a mile away. After one short third class step, it is a short walk to the summit, where there was no register, but an old Coast and Boundary survey marker. It looked like it might rain again, so I did not hang out long before retracing my steps. Surprisingly, it actually cleared as I descended, and I had a nice view of the little tarn, and of Silver Star and the Gardiners to the south. Leaving the ridge earlier than I gained it, I quickly reached the lake via a mixture of sand, scree, and snow, then hiked/jogged back to the car for a late lunch. With a much-needed short day, I had time to head into Winthrop for maintenance before driving back west to the Real Mountains.